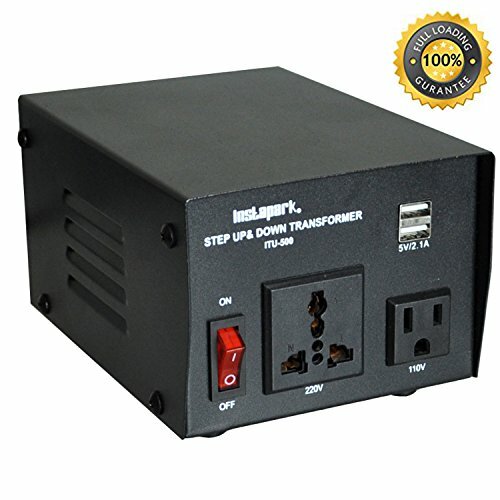 Made by one of the leading manufacturers in the industry, the Instapark ITU series step up/down voltage transformers offer you a safe, reliable, affordable, and convenient solution to converting voltages from 110/120 volts up to 220/240 volts or from 220/240 volts down to 110/120 volts for both home use and industrial applications. Featuring a heavy-duty power cord with a standard US 3- prong plug, the ITU-500 has a total of three outputs, one designated for 110 volts with a US standard outlet, the other for 220 volts with a universal outlet. Most importantly, all two outputs can be used simultaneously and continuously. Prior to purchasing a voltage transformer, in order to avoid users' frustrations and unnecessary returns, it is extremely important to check and find out what your appliance's Maximum Power Consumption (MPC) in watts is. The MPC must be less than this transformer's Maximum Load Capacity (MLC), which is 500 watts, or it will NOT work. For safety concerns and optimal results, the manufacturer recommends that the transformer's MLC should be equal or greater than your appliance's MPC by 20%. For example, if an appliance has a wattage of 1000 watt, then the MLC must be at least 200. For your reference, here are some examples of appliances with a heating element consumes a lot more than 500 watts, these appliances include toaster ovens, coffee machines, space heaters, hair dryers and more, they will NOT work with this 500W transformer, please choose a different model with higher MLC accordingly. Manufacturer's 3-year limited warranty. Please contact us via email if you have any questions. This voltage transformer made by Instapark has a limited 3 year manufacturer's warranty.